Saboten has got good quality tonkatsu! Jeez, the title sums up my review in 6 words. Good food needs no long introduction right? I’ve been on a Japanese food kick for very long now… in fact, I just had Watami the day before I went Saboten, but I wasn’t exactly satisfied with the food at Watami, so I had to have good Japanese food again to satisfy the craving. No, I’m not pregnant. I’m just a glutton. I usually order the seafood set because I don’t want to take chances with sinewy pork cutlets (they’re a bit of a hit and miss), but there wasn’t anything that caught my eye this time. 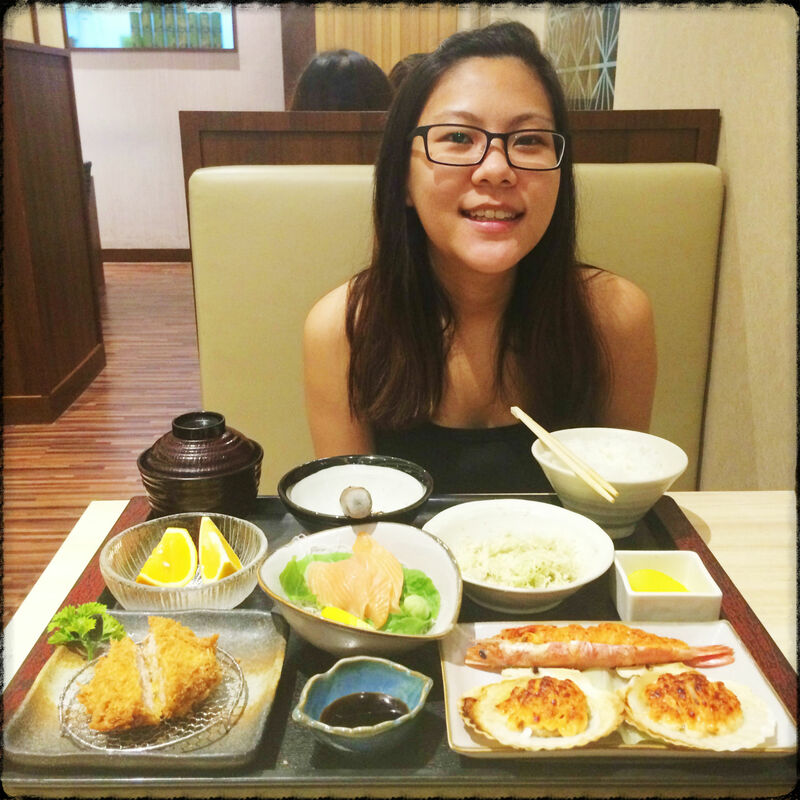 So I went for a mixed set with mentai scallops and prawn, salmon sashimi and a breaded pork loin. The set was also served with a side salad, chawanmushi and fruits. The side salad consisted of crisp refreshing cabbage with creamy sesame dressing, so yummy that I wanted more! But the cabbage was non-refillable at the IMM outlet. The chawanmushi was soft, perfectly seasoned and steamed and even had a fresh prawn in it! I love anything mentai, but the scallops were disappointing. They were not fresh, and had a bit of fishy taste. The sashimi wasn’t the best I had, I was served 3 slices, out of which 2 slices had tendons. Yucks. Thankfully, the pork loin was perfect: a good ratio of fat to meat and it was breaded and fried without being too oily. My legendary chicken boy. Hee hee… I call him so because he loves chicken meat! He chose a set that included teriyaki chicken, saba fish, and tenderloin tonkatsu.